Music is a vital part of everyday life in my family, whether it’s pushing to get through that last half mile on the treadmill or teasing my 2-year-old out of a bad mood. So a couple of years ago I turned to Slacker Internet radio as a great source of commercial-free music at home and on my smartphone. Today, it got even better with the ability to search for individual tracks and albums and cache them for playback offline later. What I like about Slacker is its traditional approach to radio. Live DJs program its 153 stations, so careful attention is paid to the mix and pacing and some of the stations can be quite eclectic. For instance, I like to work out to the Party Hits station, which has a little bit of everything—Hip Hop, Rock, Pop, even some Country. I often hear music from artists I’ve never encountered before—not surprising with the service’s 8 million song database. And I love something I can mark it as a favorite so it plays more frequently, or I can ban tracks and artists. Slacker’s big competitors, Pandora and Rhapsody also have radio stations. Pandora’s music is pulled from a database call the Music Genome Project, which is compiled by 50 real live music analysts that evaluate each track based on nearly 400 individual criteria, including melody, harmony, rhythm, vocals and more. Using these criteria, Pandora generates a station based on an artist or track you like. You can then tune the station to your liking by marking tracks as favorites or banning tracks and artists. Rhapsody and Slacker also have the ability to generate custom stations based on artists and Rhapsody has some pre-programmed stations, but unlike Slacker, you can’t customize its stations. Rhapsody and Slacker both have premium services ($10 per month) that let you download and playback tracks on mobile devices (Pandora doesn’t). You can search for search for specific tracks or browse, starting with artists you know and who’s related. Rhapsody helpfully breaks it down into contemporaries and influencers. Slacker comes in three subscription levels. The free service comes with ads and a limited number of times you can skip a track. With Radio Plus ($5 per month or $47.88 per year subscription), you can listen ad-free, get complete song lyrics, skip an unlimited number of tracks and can save your stations for playback offline. Slacker Radio Premium ($9.99 per month) adds the ability to save individual songs, albums and playlists. Streaming music is limited to one mobile device at a time. 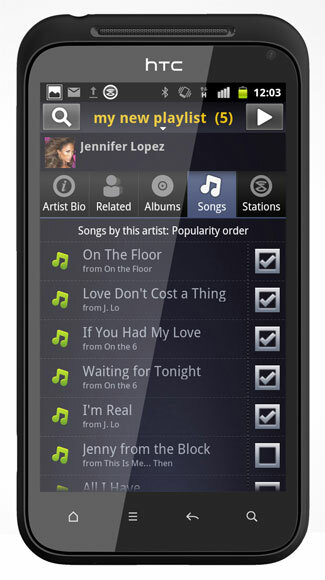 Rhapsody starts at $9.99 for one device or $14.99 for three devices. Music really does soothe the savage beast in my kids. Sometimes it’s playing my 2-year-old’s current favorite I’m a Gummy Bear to make him smile, other times it’s an impromptu freeze dance party just before dinner, but I’m always grateful that Slacker has my back. Pandora totally saves me during our witching hour - 4pm to 5pm. The kids love the folk stations as well as the Disney station. Tempted to check out Slacker - so a very timely article! Thanks for the info! You never really told us what a ‘Song Request’ is on Slacker. Could you enlighten us (since it’s in your title)? FYI. I’m a Slacker subscriber (Slacker Radio Plus) which is only $3.99/mo. Maybe they lowered it since you wrote this article? “Song requests” was referring to the ability to search for individual tracks and albums and cache them for playback offline later.